With CANape and vSignalyzer, you focus on the measurement data that is relevant to you. You create panel user interfaces for sequence control of the analysis process and use these to visualize your measurement results. Even extensive analysis functions and data mining calculations can be started with a few mouse clicks and run as fully automated tasks. Thanks to the high degree of automation, you can even analyze a lot of very large measurement files. For analysis of measurement data, you can apply any evaluation algorithms to your measurement data based on existing functions in the library or functions you create yourself. The result of the functions are available as a virtual signal and can be displayed in the display windows like a real signal or used again as an input value for other functions. Powerful printing and reporting tools are integrated for documentation of the results. 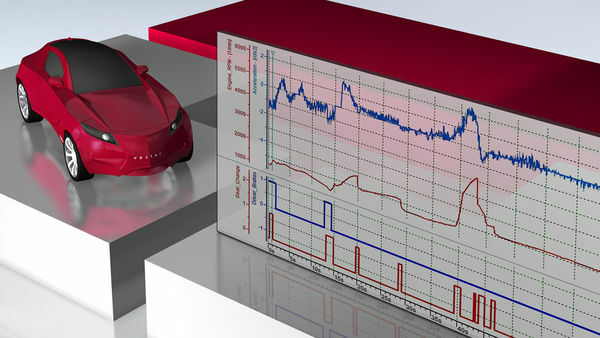 CANape and vSignalyzer offer many possibilities for efficient analysis of all types of measurement data. Measurement data is visualized in the window configuration used for the recording or in any analysis view (which you can easily create yourself). Compare the contents of multiple measurement files directly by loading them simultaneously. Zoom in on the signal sequences as desired. Identify the time instant of interest with the cursor and display it in time-synchronized windows. Simplify reporting and drag windows or whole pages into documents such as Word or PowerPoint files or generate images and PDFs directly. Besides just the visualization of measured signals, mathematical functions are often needed, for example, for smoothing of noisy signals with filters, calculation of histograms, or setting off of multiple signals against each another. Use drag & drop to move mathematical functions (for example filters or calculations) from the existing library and see the calculated result immediately. Use the existing function editor and write your own analysis functions with CASL (Calculation and Scripting Language) integrated in CANape and vSignalyzer. You already have existing C/C++ code? Use it to compile a DLL for use directly in the tools. Build your own function library. You have analysis functions in the form of Simulink models? Use the Simulink Coder to directly generate code for the "CANape" target and use the functions for evaluation. In analyzing the measurement data, you can apply any analysis algorithms to your measurement data with functions existing in the library or functions you create yourself. These functions produce a virtual signal that is then available and can be displayed just like a real signal in the display window or be used as an input variable for other functions. For development of an automated data analysis, you need programming skills, in general. You specify the analysis using the mathematical functions. Define – based on a measurement file – your analysis. Define your "Data Mining" by specifying which files are to be analyzed. Start the analysis, and generate your reports. Start the finished analysis, generate reports, and review them. Alternatively, you obtain finished reports through automation if, for example, new logger files are being stored on the server.